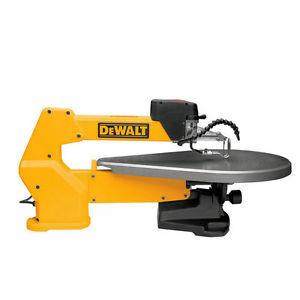 The DeWalt DW788 scroll saw comes with a parallel-link arm setup that helps create detailed, accurate work pieces, significantly decreasing noise and vibration in the process; the double-link arm ensures extremely accurate cuts. The arm design swivels from the rear of the saw to the front, which makes lifting the blade easy when cutting materials from the inside. Weighing 56 pounds, this DeWalt scroll saw is fairly heavy-duty but still portable enough to be easily carried around in a shop when there isn’t a permanent place to position the saw. Let’s learn more about the saw in this Dewalt DW788 scroll saw review and see if it’s the best scroll saw to buy. The saw’s heft adds to its robustness and smooth functioning. It stays in place and is unbelievably quiet for its power delivery. DeWalt DW788 blades can be easily changed. This is not necessarily the case with most other saws – blade changing with them can be a major pain, in fact. The blower exceeds expected performance and since it has a bendable, long arm, you get a lot more choices with its positioning. The DeWalt stand doesn’t come with the package. Moreover, it’s heavy at the top and also unwieldy – a bit too narrow and tall. You can opt for stands from other brands. There are only two blades in the package, which aren’t of the best quality. If you are planning to work a lot with this saw, you would have to buy some additional blades. However, the bundled-in blades are ideal for small edges and cuts. • What is the maximum hardwood piece thickness the saw can cut easily? The saw can cut pieces up to a thickness level of 1.5 inches. This includes maple wood and also chessboard pieces. • Are there any rattling sounds at different speed settings? The saw doesn’t vibrate much at high speeds. In fact, there is minor vibration only at slower speeds. Adjusting the motor mounting crews can help eliminate this vibration. This is a minor problem faced when using the saw right out of the box. • How to find if the saw is made in the U.S. or Asia? DeWalt has manufacturing units in Mexico, China, Thailand, Japan, and Korea. It ceased its USA-based operations in 2002. To find out where exactly your saw was made, refer to the motor sticker. • Does the product package include a stand? There’s no stand in the package. You’ll have to purchase the stand separately. You can even make one from wood, if you know how. The package contents are blades, hex wrench, and the saw. • Is it possible to use the saw with round blades? Round blades can be used, but they’re not preferred. Usually, flat blades complement the DeWalt DW788 the best. Also, round blades can be a bit difficult to use compared to flat blades. The DeWalt DW788 is ideal for both beginners and professionals, making it quite a flexible equipment. Moreover, it packs in quite a lot of power and resilience for the compact body it’s enveloped in. Also, there is not a major learning curve to the saw and its operation, which makes it quite easy to use even for amateurs.